In January 2018, a group of members, clergy and staff gathered offsite for an all-day workshop to discuss, dream and discern where God is calling Manchester UMC over the next four years. From that session, the group proposed six priorities and related 4-year goals to the church Leadership Board. The group also recommended that teams of laity, staff and clergy be formed to collaboratively develop strategies that support the achievement of the six priorities and their goals. 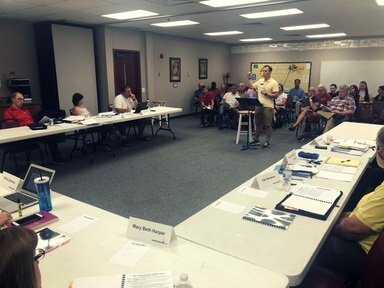 In February 2018, the Leadership Board of Manchester UMC approved the “2021 Plan” (PDF) and the creation of six cross-functional “WIN Teams” comprised of nearly 50 members, clergy and staff to work on each priority and goal. Each WIN Team was also asked to determine if the goal is achievable and whether it should be adjusted up or down. 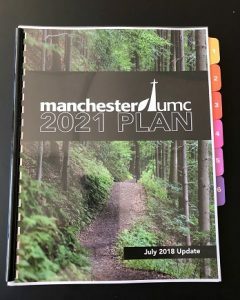 This page is designed to keep the people of Manchester UMC informed about the “2021 Plan” and specifically about the work of each WIN Team. Minutes from WIN Team meetings are posted to this page as soon as they become available. Questions, ideas and input related to the work of each WIN Team are invited and can be emailed to the leader of the WIN Team (shown below). Each of the WIN Teams gives progress updates to the church Leadership Board every 3 months. The first of those updates occurred on July 8, 2018. A copy of each team’s written progress updates to the Leadership Board is available below as a PDF. Paper copies are available upon request by contacting Tiffany Conway. 1.) WORSHIP – Shape our worship experiences to reach a broad demographic. Goal: By the end of 2021, our worship attendance will increase to at least 1,350. WORSHIP WIN Team Members: Marty Dauer, Gary Ford, Beth Hunyar, Pastor Stephanie Lendt, Brad Kovach, Kevin McBeth, Chris Reiss, Kiersten Rose, Tara Sintek. 2.) MISSION – Provide needed resources and assistance to residents in our local communities. Goal: By the end of 2021, resource 1,000 people within the Parkway, Rockwood and Valley Park School Districts. WORSHIP WIN Team Members: Autumn Dennis, Lisa Fetters, John Himpel, Liz Schubert, Cindy Steiner, Cindy Wolk. 3.) DISCIPLESHIP – Grow the number of people connecting in Christian community and living more missionally. Goal: Clear and simple pathways/bridges available and used to help 500 people at Manchester UMC take a next step on their faith journey. WORSHIP WIN Team Members: Jim Clark, Mike Clement, Tiffany Conway, Linda Lange. 4.) YOUTH – Grow the number of middle and senior high students actively engaged at Manchester UMC. Goal: 120 youth are actively engaged at Manchester UMC each school week. WORSHIP WIN Team Members: Beth Boemler, John Cargile, Mary Beth Harper, Kem Mogannam, Genny Schumacher, Ivy Williams (youth), Jeff Woodhouse (youth). 5.) YOUNG ADULTS- Grow the number of people ages 25 to 35 having a first-time experience with Manchester UMC. Goal: By the end of 2021, 4 out of every 10 people having a first-time experience with Manchester UMC will be between ages of 25 and 35. WORSHIP WIN Team Members: Chessey Brenton, Christy Fareel-Queensenc, Emily Gauvain, Sarah Healy, Heather Kellenberger, Nicki Reinhardt-Swierk. 6.) FINANCIAL – Strengthen and grow the financial resources of Manchester UMC. 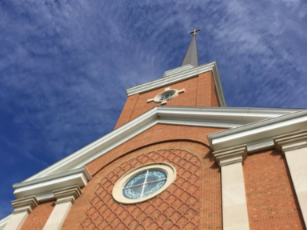 Goal: By the end of 2021, $500,000 has been raised for phase 1 of the HVAC projects, and $400,000 has been raised to pay down Manchester UMC’s debt/mortgage. WORSHIP WIN Team Members: Rev. David Bennet, Ed Crawford, Ali Fields, Debbie, Hilton, Tom Hilton, Cheri Hoeferlin, Craig Hoeferlin, Tom Lawrence, Jennifer McGillivary, Matt Pasley, Kurt Rehwinkel, Joe Strohm, Vicki Strohm, and Phil Wiseman.